I recently started redrawing Cantarell (https://fonts.google.com/specimen/Cantarell and GNOME's version, also https://fonts.google.com/specimen/Cambay) in Glyphs because I was fed up with FontForge and the very mediocre quality of the typeface (and the later Cambay) in general. I'd like to get some feedback on the base latin glyphs and numerals. The thin and black versions are drawn, regular is interpolated. 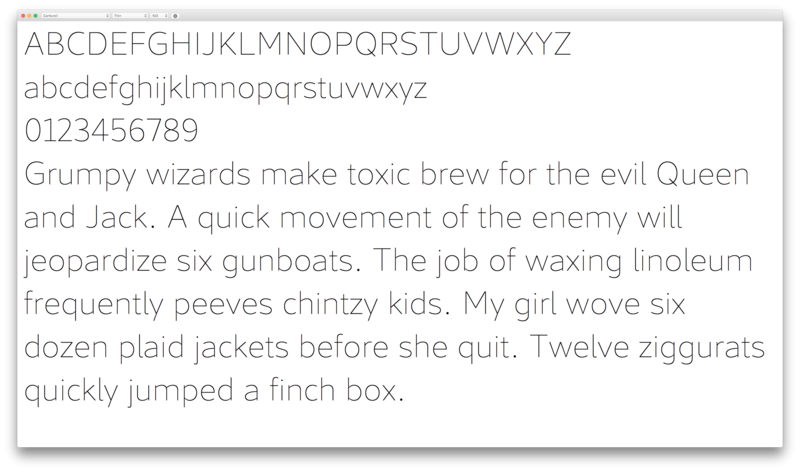 The fonts approximately encompass the Google Fonts Plus glyph set. The repository is at https://github.com/madig/cantarell-fonts (might not be up to date, as of the time of this writing). The 2017-07-27 version of the source file and the generated .otfs is attached. 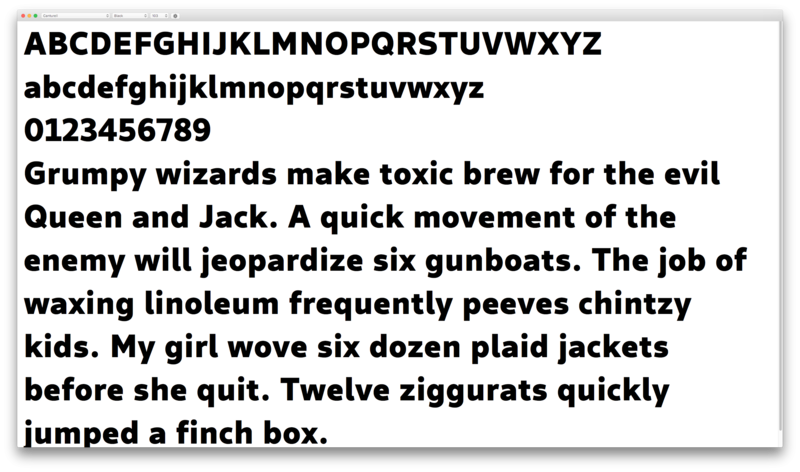 The motivation behind this typeface is to be the UI font of the GNOME project, (type 1) hinting is therefore a priority. I took inspiration from Source Sans Pro and you'll probably see the similarities (letter forms and e.g. the thin-black master approach). Cantarell is a bit wider, though. I managed to iron out the personality of the original design, for better or worse. The main ingredient for the redesign was Ctrl+Alt+1. The vertical metrics should be compatible with Noto Sans UI, as I'd like that to be the fallback font for GNOME. You can have a closer look at the typeface in its' supposed natural habitat by dragging the fonts onto http://vernnobile.github.io/webfont-testing/ and http://www.impallari.com/testing/. I'm thinking about raising the x-height, especially because of small on-screen text sizes that keep turning up on the web. This is good, and mostly faithful to Cantarell’s personality, but I think it’s definitely too much of a departure from the original. I remember seeing the changes between versions 0.0.24 and 0.0.25 last year and thinking, “Why is Cantarell turning into Source Sans Pro?” and this redraw takes it even further. Cantarell really grew on me (at small sizes on a low-res screen) when I was using GNOME as my everyday desktop environment, and its original personality is its raison d’être. If it’s going to become more and more like Source Sans, GNOME should just switch to Source Sans outright and save you all the work. In particular, the sharp increase in the roundness of the curves/bowls in a, b, d, f, g, j, p, q, and 5 is too much of a difference. A few other things that seem like change for change’s sake are the altered stem-to-leg design of K/k, the slenderized quote marks, and the five-pointed asterisk. I think the goal of the Cantarell redraw should be to make it a better version of itself—not to morph it into a whole other sans. Oh, but: I chose the five-pointed asterisk because the six-pointed one tended to turn into a black blob at bolder weights. And you mean slenderized as opposed to rectangular? That was actually one of the changes that Pooja Saxena made for Cambay, which Dave Crossland said was a newer design of Cantarell that I should base my work on. For a face that is intended for UIs, please ensure that the default numerals are tabular. 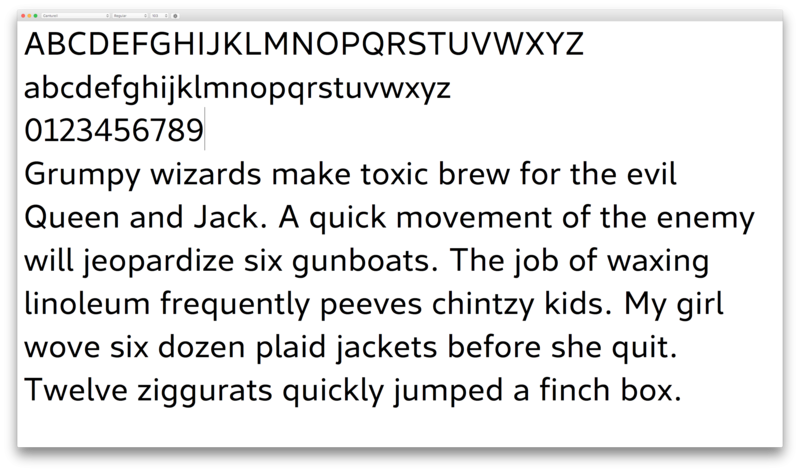 I'll probably handle that later, as I also want to replace the version on Google Fonts, which is intended for longer texts. Maybe a "Cantarell UI" variant or some such. Dave Crossland hooked me up with Jacques Le Bailly a.k.a. Baron von Fonthausen and he helped me tremendously in getting somewhere with Cantarell. I went back to Dave's original design and first reworked the regular, then created the thin and extra bold masters from that. No kerning as of yet. Once you have started a redesign, consider including local forms for Bulgarian, Serbian, and Macedonian scripts. This is a small effort that will satisfy about 20 million people. Noted. I currently only have Latin in there, I want to get more coverage of Google Fonts gylph sets first.